As we heard from Kyle Weisbrod yesterday, every ultimate player inevitably hits certain plateaus in their growth. Today we explore how to overcome one specific plateau that we’ve all gone through. You’ve been throwing for a while now. You have the basic shape of a backhand, you’ve reached that wonderful ultimate milestone of completing a forehand in a game, and you’ve finally stopped switching your pivot foot. But now you’re stuck. The same odd issues keep popping up, and no matter how much you throw, you just can’t iron out the kinks. Welcome to the Beginner’s Throwing Plateau, where progress is elusive and you’ve learned just enough to know how much more there is to learn. Where do you go from here? Taking your throwing skills from passable to impressive requires focus and repetition. I’ve identified some common struggles that plague newer players and given some suggestions for how to combat them, but the grunt work is up to you. Focused, stationary throwing builds the muscle memory that will translate into automatic, habitual success under pressure. Want effortlessly excellent throws? Throw every day, and throw with intent. Your forehand gets there — at least most of the time — but it’s not pretty. It never seems to travel in a straight line, and throwing in the wind? Forget about it! How do you go from a forehand that merely gets there to a forehand that consistently gets the job done? The Problem: Not enough wrist snap. Wrist snap makes a forehand; it’s called a flick for a reason, after all. 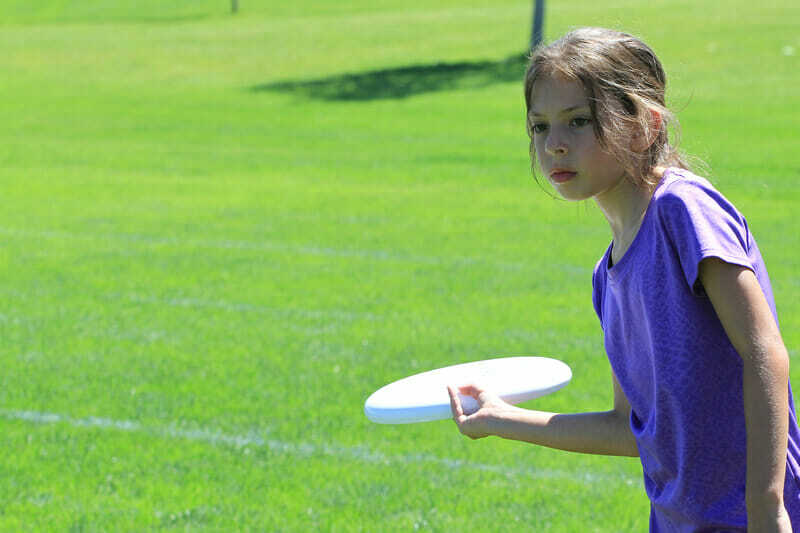 For those new to ultimate, it can be difficult to shake the temptation to lob a forehand to your receiver like it’s a baseball, propelling forward from the shoulders and neglecting to give it the spin it needs. The Solution: Drill wrist snap by removing every other part of the throw. Taking away the added noise of what to do with the rest of your body allows you to focus on the most fundamental building block, the snap. Stand five yards from a throwing partner, plant your elbow on your hip, and snap your wrist. Strive for a completely flat, wobble-free throw every time. You’ll be surprised how much power you can generate with such a small motion. As this feels more and more comfortable, gradually move your throwing arm away from your side and increase your throwing distance. Experiment with adding in your shoulders, always focusing on and finishing with the wrist snap. You’re finally pivoting on the correct foot every time, but sometimes your pivot foot just won’t stay down, no matter how many times your captain reminds you to watch your travelling. What’s going on? The Problem: Lack of core engagement. Chances are, you’re lifting that pivot foot because you’re trying to generate power. Pushing off of your back leg will put you off balance, while initiating momentum from your core muscles instead helps you stay in control while also generating more power. Oh, and you’ll stop getting called for travelling. The Solution: Drill balanced, powerful, core-based throws by actively engaging your core muscles. Flex your abdominal muscles and feel your core engage. Start by slowly pivoting and faking, focusing on keeping your back straight and initiating every movement with your core. Now, glue your pivot foot to the ground and twist from the core to throw. After a few minutes of focused throwing, your core should feel a bit sore, but you should have gained greater control over the movement of your lower body while pivoting. Your throws are on point… until you try to break the mark. The smallest defender feels like an impassable obstacle and nothing you know about throwing prepared you to succeed here. How can you translate stationary throwing mechanics into mark-breaking skills? The Problem: Not enough shoulder extension. You’re likely not pivoting far enough and releasing the disc very close to your body. Learning to throw with a wider release point will help you get around your mark and keep your team’s offense moving. The Solution: Drill wide release throws by pushing the comfort zone of your widest release point. Slowly and deliberately, pivot out as far as you can and reach your arm as far out as you can. You might feel a little off balance at first, that’s ok! Push your boundaries little-by-little as you develop the coordination necessary to bring wider release points into game scenarios. You’ve started incorporating hucks into your throwing repertoire. Some hucks sail beautifully out in front of your receivers, but others float way too high and tail off at odd angles. How can you reign in these wayward hucks? It’s very, very tempting to throw your whole upper body into a huck. You need to generate more power to make the disc go further, right? Well, the power needs to come from your hips and your core, not from your shoulders; overusing your shoulders can cause you to lean back as you release a huck. Leaning back angles your release point upwards, makings it much harder to control the disc’s flight path. The Solution: Engage your core and lean slightly forward into your hucks to bring them under control. Ideally, your shoulders should be directly over your hips as you release a huck, but at first it might help to actively think about driving further forward with your core. Leaning forward into a huck makes it much more difficult to rely on your shoulders for power, so you’ll naturally start to understand how to build that power from your core instead. As hucking from your core starts to feel more natural, try some hucks from power position1. Maintain the same controlled throwing motion you have while stationary, and don’t let your shoulders take over. Remember, getting to that next level is up to you. Great throws take repetition, but if your throwing practice is unfocused, you’re likely reinforcing bad habits that you’ll have to unlearn later. Establish good throwing mechanics now by recognizing what you want to improve and focusing in on one small adjustment at a time. Practice with intent, and you’ll beat the Beginner’s Throwing Plateau in no time. Comments on "Tuesday Tips: Beat the Beginner’s Throwing Plateau"